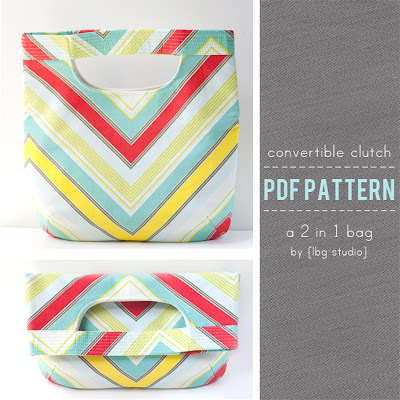 convertible clutch/2 in 1 bag pattern giveaway!!! | lots of pink here! 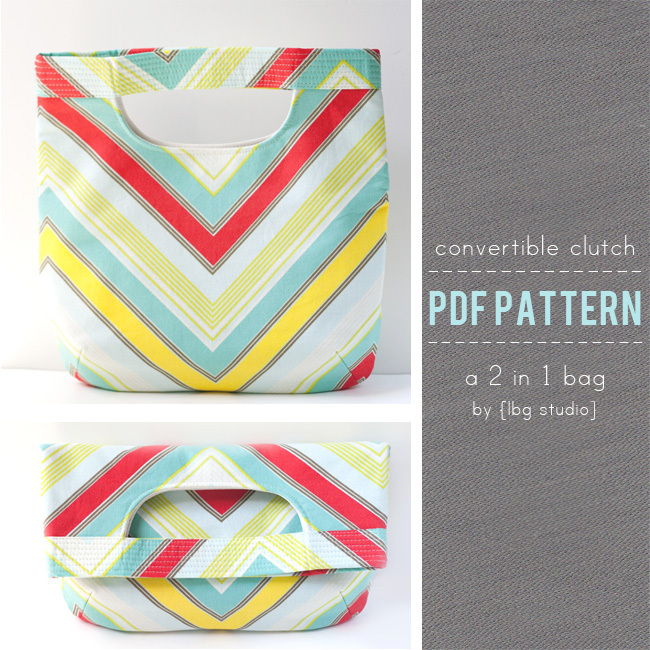 convertible clutch/2 in 1 bag pattern giveaway!!! It does not disappoint!!! The shape is fantastic!! It's modern in a way that's both fashion forward and classic at the same time. I made mine out of two prints from Anna Maria Horner's Loulouthi line. The exterior print is very large scale but I really love how it worked on this bag. Each side looks so different and I love both. You can then fold the bag down and you have a clutch!!! The handle opening is large enough that you can slip it over your wrist too if you need both hands. Genius!! The size is great, large enough to hold all of the necessities but not so big that it will be heavy or hard to hold. 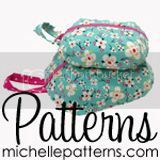 The pattern includes a patch pocket to keep a few items separate. It was really easy to follow and well written. She includes so many photos which always helps too! I LOVE the handle!!! It's a great way to add a second print onto your bag and is totally different from any other handle that I've ever put on. If you make the bag, I would totally recommend that you follow Vanessa's suggestion and add the extra rows of topstitching. It really makes the bag look so much more professional. SO... Vanessa has graciously offered to give away a copy of her convertible clutch pattern to one of my lucky readers!!! Woo hoo!!! In order to enter, please leave a comment on this post letting me know what fabric you would make your convertible clutch / 2 in 1 bag out of if you win!!! PLEASE make sure that I can get in touch with you if you win!!!! I will choose a winner randomly on Monday morning. Good luck!!!! I love it! I may have to be a copycat & use the loulouthi I just got, as well! Amy, for some reason I have always been drawn to the Ty Penington fabrics, any of them in the chartreuse colourway. I don't have any, but if I were going to make this clutch, that is what I would hope to use. I will use some IKEA Gunilla black fabric. This bag looks great and would be a nice addition for christmas gifts. I've got some great Ikea home dec fabric in orange which would be perfect! I think I'd have to make myself a few bags! probably at least one with a large scale print like Prince Charming snails, and something with a smaller, maybe geometric, print. oooh, your bag is beautiful! I don't have that fabric though, but I do have some Amy Butler that I've been hoarding - perfect for bags! As my Dad would say, "This is snazzy". I have some of the latest AMH fabric I would have to use, since this one is so gorgeous. your clutch is SO cute! looks like a great pattern. hm...i've got some AMH innocent crush that could look really great on this, or maybe some lecien linen. it would be hard to choose. thanks for the giveaway! I have some 1/2 yard cuts of Josephine Kimberling's last collection that would be perfect! From xita. a very tipical and colourful brazilian fabric ! The bag is super cute! I would make the bag in any fabric from Anna Maria Horner, her fabrics are gorgeous! This is so cute! I would probably use a purple print from Innocent Crush :) Or one of the flowery Terrain prints. Thanks for the chance! I love what you used! How about the dots from the Hometown line by Sweetwater? mmmmm Thanks! I have some Amy Butler fabric I'd LOVE to use on this clutch!!! Pick me! Pick me! The clutch is awesome! I was thinking Around Town by Jenni Calo would be a fun fabric to use. Also Hometown by Sweetwater might be fun too! The Stop Sign fabric, that's the one with the names of the towns. Of course it's a small print and it might be busy, but I'd love the chance to find out! Maybe use one of the coordinating polk-dot fabrics for the handle! I love your fabric choice for this bag. Actually, I've loved all the versions I've seen on various blogs. The pattern seems like a great vehicle for displaying fabrics nicely. I have some Jay McCarroll 'singing forest' which would work well. I've been eying this pattern. I also adore AMH's Loulouthi, but I've already made myself a bag with it. I'd need to look for something a little more wintry. I LOVE this bag, and I'm not a girl who usually gets excited by bags! Daren't wait to see if i win the comp - I went straight over and bought it anyway! What a great pattern! 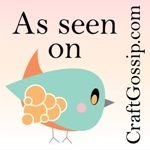 We have just got the Stampin' Up! fabric in the UK, so I would use that, probably the Timeless Portrait pattern. I love this pattern! I would use some of the home deco fabric I have in my stash. I believe it is Joel Dewberry fabric. I want to get some Loulouthi, and this would be the perfect reason! BEAUTIFUL. I absolutely love it! I love the handle too such a cute bag! I have some Echino I have been saving that I would definitely use!! I love the bag!! I don't know what specific fabric I would pick but something by Anna Maria Horner, Amy Butler, or Heather Bailey would be wonderful!! Thanks for the giveaway! love the pattern and would have to select something from my fabric stash. Ah! Your bag looks sooooo sweet! I think I would try some of my 70's vintage fabric on this pattern. I think I would use some Hello Kitty and make it for my DD. Thanks for a great giveaway! I love this design, doubt I could keep myself to 1 bag if I had the pattern. I would have to make one to match each of my fav outfits. I would have to go with the Black and white Lables & Demask from "Lost and Found" from Riley Blake Designs. Black and white goes with everything. I'm learning Chinese language because I believe it's the only way to really learn about China.When I was searching for a place to learn to speak Chinese, I called several schools. Hanbridge was the best because they had excellent teachers and a very friendly and welcoming spirit. ?I really appreciate the opportunity to learn here and would recommend Hanbridge to others.